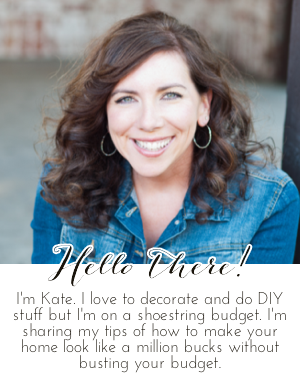 Chic on a Shoestring Decorating: Flaunt it Friday 158! Hi friends! How is summer treating you?? We were doing super awesome until strep throat struck. Strep throat in the middle of June?!? It shot this whole week of glorious summertime right in the booty. We all got it. All 4 of us. Obviously this was bad news but, it was better than all 4 of us getting a stomach bug at once. That is it's own special kind of H,E,double hockey sticks. We survived and are recovering but had to postpone our garage sale. This isn't that big of a deal except that they are calling for beautiful weather this weekend. Hope it will be the same for our sale. And, Mr. Chic doesn't get his garage back for 2 more weeks. Sorry babe! Anyway, last year our garage sale was very profitable, we earned $80 bucks an hour! Check out my tips for a great yard sale. It's a lot of work but definitely worth the time if you do it right. I'm looking forward to another good sale this year. Thanks for the party! Hope the strep throat leaves quickly! Oh man...strep in June is just not right. :) Gargling with salt water always helped my kids along with lots of chewable vitamin C. Wishing you all a very speedy recovery. :) Thanks again for hosting. I really appreciate all the time and effort you put into it. :) Hope you have a great weekend! Have a great weekend...thanks for hosting! Dang, Kate! That stinks. Strep Throat is always awful but way to ruin one precious week of summer. hope you are all getting abck to feeling better! I hope you all feel better soon! Thanks for hosting. Thanks for hosting. Hope you all feel better soon! Have a great weekend! I hate strep throat! I hope you all get over it quickly! Thanks for hosting! Bummer about the strep! My daughter has it too! Right during final exams! WTH with summer sickness - it should be outlawed! Hi Kate - strep is not fun at all. Hope that you are all recovering well. Thanks for hosting. Hope you write about your garage sale (the one in two weeks).